Posh have signed Chelsea centre back Alex Davey on a 30-day loan deal with the 20-year-old going straight into the squad for today’s league opener against Rochdale at Spotland. The Scotland under-19 international will provide defensive cover with Posh suffering a number of injuries at the back, including Michael Smith, Ricardo Santos and Jack Baldwin. Davey joined Chelsea at the age of 10 and was part of the Blues’ side that lifted the inaugural Barclays under-21 Premier League. He made 13 appearances for Scunthorpe United in a loan stint at Glanford Park last season, helping the Irons move away from danger at the foot of the League One table. 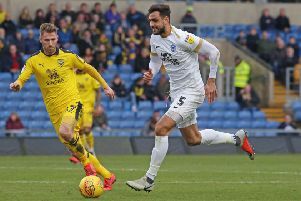 Posh manager Dave Robertson said: “Alex is a centre back that I have been tracking for a number of years. His performances for Chelsea’s under-21 side have been excellent. “Myself and my assistant Grant McCann went to watch him play for Chelsea on Monday evening at stadium:mk. He put in a solid performance in a good win for their under-21s against a strong MK Dons team. “He is one that has been on the radar for a while. I am over the moon to get a player with that quality and defensive attributes into the building to support the squad. Davey will wear the number 17 shirt during his stay with the club.